Bruce Spence, a Nehiyaw Indigenous man living in Winnipeg, is challenging a Manitoba Public Insurance (MPI) decision to revoke his personalized “NDN CAR” license plate. Photo submitted by Justice Centre for Constitutional Freedoms. 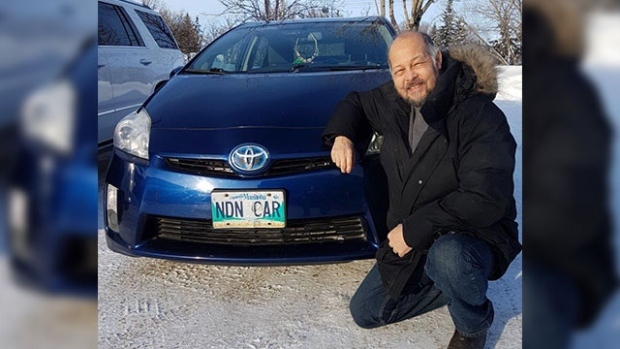 Bruce Spence, a Nehiyaw Indigenous man living in Winnipeg, is challenging a Manitoba Public Insurance (MPI) decision to revoke his personalized “NDN CAR” licence plate. Spence, a producer with Aboriginal People’s Television Network (APTN), purchased the license plate seven years ago and chose the inscription as a refernce to the 1992 song “Indian Cars” by Indigenous musician, Keith Secol. The music video for the song features an old broken-down car, which was what Mr. Spence was driving when he purchased the plate. Spence didn’t hear form MPI until this past February when MPI wrote to him of their decision to revoke the licence plate. Spence is being represented by the Justice Centre for Constitutional Freedoms.